First Man is a 2018 American biographical drama film directed by Damien Chazelle and written by Josh Singer. Based on the book First Man: The Life of Neil A. Armstrong by James R. Hansen, the film stars Ryan Gosling as Neil Armstrong, alongside Claire Foy, Jason Clarke, Kyle Chandler, Corey Stoll, Ciarán Hinds, Christopher Abbott, Patrick Fugit, and Lukas Haas, and follows the years leading up to the Apollo 11 mission to the Moon in 1969. Steven Spielberg serves as an executive producer. The project was originally announced in 2003, with Clint Eastwood slated to direct. After that rendition fell though, Chazelle, Gosling and Singer all signed on by 2015, and principal photography began in Atlanta, Georgia in November 2017. First Man had its world premiere at the Venice Film Festival on August 29, 2018, and was theatrically released in the United States on October 12, 2018, by Universal Pictures. The film received critical praise, particularly regarding the direction, Gosling and Foy's performances, musical score, and the Moon landing sequence, although its choice to not depict the planting of the American flag on the lunar surface led critics and politicians from both political parties to debate the film's stance on patriotism. It grossed $104 million worldwide against its $59 million production budget, and received numerous award nominations, including two nominations for Best Supporting Actress (Foy) and Best Original Score (winning the latter) at the 76th Golden Globe Awards and seven nominations at the 72nd British Academy Film Awards. The film also received Academy Award nominations for Best Sound Mixing, Best Sound Editing and Best Production Design, and won for Best Visual Effects at the 91st Academy Awards. By 1965, the family has settled in Houston, and Armstrong awaits selection for a crew. After the Soviets complete the first extravehicular activity (EVA), Armstrong is informed that he will be the commander of Gemini 8, with David Scott as the pilot. Prior to the mission, See and Charles Bassett are killed in a T-38 crash, deepening Armstrong's grief at the string of recent losses. Armstrong and Scott successfully launch on Gemini 8, and dock with the Agena target vehicle, but soon afterward, the spacecraft begins to spin at a rapid rate. After nearly blacking out, Armstrong activates the RCS thrusters and safely aborts the mission. Armstrong initially faces criticism, but NASA determines the crew is not at fault. Later, White reveals that he has been selected for the Apollo 1 mission along with Gus Grissom and Roger Chaffee. Apollo 11 successfully launches and arrives at the Moon on the fourth day out. Armstrong and Aldrin undock in the Lunar Module and begin the landing attempt, but as they descend towards their landing site, Aldrin realizes the area is full of large boulders, forcing Armstrong to take manual control of the spacecraft. The lunar module successfully lands with minimal fuel remaining. After setting foot on the Moon, Armstrong drops Karen's bracelet into Little West crater. With their mission complete, the astronauts return home and are placed in quarantine, where a rerun of JFK's 1962 speech "We choose to go to the Moon" is shown, and Armstrong and Janet share a moment of tenderness. First Man grossed $44.9 million in the United States and Canada, and $59.1 million in other territories, for a total worldwide gross of $104 million, against a production budget of $59 million. On review aggregator Rotten Tomatoes, the film holds an approval rating of 88% based on 375 reviews, with an average rating of 8.1/10. The website's critical consensus reads, "First Man uses a personal focus to fuel a look back at a pivotal moment in human history – and takes audiences on a soaring dramatic journey along the way." On Metacritic, the film has a weighted average score of 84 out of 100, based on 56 critics, indicating "universal acclaim". Audiences polled by CinemaScore gave the film an average grade of "B+" on an A+ to F scale, while PostTrak reported filmgoers gave it a 79% positive score. First Man received ten nominations at the 24th Critics' Choice Awards, where it won for Best Editing and Best Score. The film was also nominated for seven awards at the 72nd British Academy Film Awards, including for Best Supporting Actress for Foy and Best Adapted Screenplay for Singer, as well as two nominations at the 76th Golden Globe Awards, with Hurwitz winning for Best Original Score, and four nominations at the 91st Academy Awards. It won the Academy Award for Best Visual Effects. The film revived international interest in Armstrong's first wife Janet, who plays a central part in the film. She died a few months before the film's release. 1 2 3 4 5 6 "Film Releases...Print Results". Variety Insight. Variety Media. Archived from the original on September 29, 2018. Retrieved July 12, 2018. 1 2 3 4 D'Alessandro, Anthony (October 14, 2018). "'Sony Swings Past $1 Billion As 'Venom' Bites $35M+; 'First Man' Lands Third With $16M+ – Sunday AM". Deadline Hollywood. Penske Business Media. Archived from the original on October 13, 2018. Retrieved October 14, 2018. 1 2 3 "First Man (2018)". Box Office Mojo. Amazon. Archived from the original on June 12, 2018. Retrieved February 19, 2019. ↑ Pamela McClintock (November 10, 2018). "First Man (2018)". The Hollywood Reporter. ↑ Rubin, Rebecca; Rubin, Rebecca (September 20, 2018). "Box Office: 'First Man' to Blast Off With $20 Million-Plus Debut". ↑ "First Man". Universal Pictures. Archived from the original on September 7, 2018. Retrieved September 9, 2018. ↑ N'Duka, Amanda (October 9, 2017). "Patrick Fugit Joins Damien Chazelle's 'First Man'; 'The Hate U Give' Casts Dominique Fishback". Deadline Hollywood. Archived from the original on October 20, 2017. Retrieved October 27, 2017. ↑ Douglas, Edward (September 29, 2017). ""Spotlight" Star Brian d'Arcy James Lands on Damien Chazelle's Moon Movie "First Man"". The Tracking Board. Archived from the original on November 28, 2017. Retrieved October 27, 2017. ↑ D'Alessandro, Anthony (October 17, 2017). "'Gotham's Cory Michael Smith Joins 'First Man's Space Crew". Deadline Hollywood. Archived from the original on October 20, 2017. Retrieved October 27, 2017. ↑ N'Duka, Amanda (October 27, 2017). "Skyler Bible Joins 'First Man'; Freddie Stroma Cast In 'Second Act'; Jonathan Goldsmith Boards 'Mamma Mia' Sequel". Deadline Hollywood. Archived from the original on October 29, 2017. Retrieved October 27, 2017. ↑ "Why 'First Man' prominently features Gil Scott-Heron's spoken-word poem 'Whitey on the Moon'". Archived from the original on October 17, 2018. Retrieved October 16, 2018. (Subscription required (help)). ↑ "Eastwood to direct astronaut film biography". Los Angeles Times. March 14, 2003. Retrieved February 19, 2017. ↑ Lee, Ashley (March 7, 2017). "Ryan Gosling's Neil Armstrong Biopic Is Set For Fall 2018 Debut" Archived September 1, 2018, at the Wayback Machine. The Hollywood Reporter/Yahoo! Entertainment. Retrieved September 20, 2018. 1 2 Tapley, Kristopher (September 3, 2018). "How Neil Armstrong Biopic 'First Man' Achieved Lift-Off". Variety. Archived from the original on October 12, 2018. Retrieved October 12, 2018. ↑ Fleming Jr, Mike (November 24, 2015). "Ryan Gosling Orbiting Damien Chazelle's Neil Armstrong Movie at Universal?". Deadline Hollywood. Archived from the original on October 18, 2017. Retrieved December 29, 2016. ↑ Kroll, Justin (December 29, 2016). "Ryan Gosling, Damien Chazelle to Reteam on Neil Armstrong Biopic". Variety. Archived from the original on December 30, 2016. Retrieved December 29, 2016. ↑ McClintock, Pamela (April 25, 2018). "Ryan Gosling, Claire Foy Share First Look at Neil Armstrong Biopic 'First Man'". The Hollywood Reporter. Archived from the original on June 12, 2018. Retrieved October 12, 2018. ↑ Knight, Molly (December 20, 2018). "Jon Bernthal on What It Means to Man Up". Men's Health. ↑ Walljasper, Matt (November 30, 2017). "What's filming in Atlanta now? First Man, Venom, Ozark—plus, you can see downtown in the new Avengers trailer". Atlanta. Archived from the original on March 15, 2018. Retrieved November 4, 2018. ↑ O'Falt, Chris (November 1, 2018). "'First Man': How Damien Chazelle Used Handheld 16mm Cameras to Cut Through the Neal Armstrong Myth". IndieWire. Archived from the original on November 2, 2018. Retrieved November 2, 2018. 1 2 "How Cinematographer Linus Sandgren Used Format to Change Visual Tone In 'First Man'". No Film School. October 16, 2018. Archived from the original on November 3, 2018. Retrieved November 2, 2018. 1 2 3 Desowitz, Bill (October 15, 2018). "Beyond Christopher Nolan: 'First Man' Redefines In-Camera VFX". IndieWire. Archived from the original on November 3, 2018. Retrieved November 2, 2018. ↑ Gelzer, Christian (December 18, 2018). "Observations From The Set Of First Man By A NASA Historian". Sloan Science & Film. ↑ Failes, Ian (November 6, 2018). "FIRST MAN: An Effects Odyssey". VFXVoice.com. Archived from the original on November 7, 2018. Retrieved November 6, 2018. ↑ "'First Man' Gets Space-Age Feel with Unusual Instruments, Retro Sounds". Variety. Archived from the original on October 31, 2018. Retrieved November 1, 2018. ↑ "'First Man' Gets Space-Age Feel with Unusual Instruments, Retro Sounds". Variety. Archived from the original on October 31, 2018. Retrieved October 31, 2018. ↑ "'First Man': Film Review | Venice 2018". The Hollywood Reporter. Archived from the original on October 28, 2018. Retrieved October 31, 2018. ↑ "'First Man' Offers an Emotional Account of Neil Armstrong's Life (Film Review)". Space.com. Archived from the original on November 1, 2018. Retrieved October 31, 2018. ↑ Tapley, Kristopher (July 18, 2018). "Damien Chazelle's 'First Man' With Ryan Gosling to Open 75th Venice Film Festival (EXCLUSIVE)". Variety. Penske Business Media. Archived from the original on July 19, 2018. Retrieved July 18, 2018. ↑ Anderson, Ariston (July 25, 2018). "Venice to Kick Off Awards Season With New Films From Coen Brothers, Luca Guadagnino and Alfonso Cuaron". The Hollywood Reporter. Prometheus Global Media. Archived from the original on July 25, 2018. Retrieved July 25, 2018. ↑ Vivarelli, Nick (July 25, 2018). "Venice Film Festival Lineup: Heavy on Award Hopefuls, Netflix and Star Power". Variety. Penske Business Media. Archived from the original on July 25, 2018. Retrieved July 25, 2018. ↑ Tapley, Kristopher (August 30, 2018). "'First Man,' 'Front Runner' and 'Roma' Among 2018 Telluride Film Festival Selections". Variety. Archived from the original on August 30, 2018. Retrieved August 30, 2018. ↑ "Telluride Film Festival Program Guide" (PDF). Telluride Film Festival. Retrieved August 30, 2018. ↑ Vlessing, Etan (July 24, 2018). "Toronto: Timothee Chalamet Starrer 'Beautiful Boy,' Dan Fogelman's 'Life Itself' Among Festival Lineup". The Hollywood Reporter. Prometheus Global Media. Archived from the original on August 2, 2018. Retrieved July 24, 2018. ↑ Lee, Ashley (March 7, 2017). "Universal Sets Ryan Gosling's Neil Armstrong Biopic for Fall 2018 Debut". The Hollywood Reporter. Prometheus Global Media. Archived from the original on March 9, 2017. Retrieved March 9, 2017. ↑ Rubin, Rebecca (October 9, 2018). "'First Man' Takes on 'Venom' and 'A Star Is Born' as October Box Office Goes Galactic". Variety. Archived from the original on October 10, 2018. Retrieved October 10, 2018. ↑ Pamela McClintock (October 11, 2018). "Box-Office Preview: 'First Man' to Blast Off in Wake of Juggernauts 'Venom,' 'A Star Is Born'". The Hollywood Reporter. Archived from the original on October 11, 2018. Retrieved October 11, 2018. 1 2 Amos, Jim (October 14, 2018). "Houston, Ryan Gosling And 'First Man' Have A Problem". Forbes. Archived from the original on October 15, 2018. Retrieved October 15, 2018. 1 2 Cieply, Michael (October 14, 2018). "What Do Words Cost? For 'First Man,' Perhaps, Quite A Lot". Deadline Hollywood. Archived from the original on October 14, 2018. Retrieved October 15, 2018. ↑ "First Man (2018)". Rotten Tomatoes. Fandango Media. Retrieved December 9, 2018. 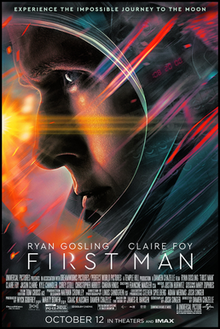 ↑ "First Man Reviews". Metacritic. CBS Interactive. Retrieved November 29, 2018. ↑ Gleiberman, Owen (August 29, 2018). "Venice Film Review: Ryan Gosling in First Man". Variety. Archived from the original on August 29, 2018. Retrieved August 30, 2018. ↑ Nordine, Michael (August 29, 2018). "First Man Review: Damien Chazelle and Ryan Gosling's Thrilling Neil Armstrong Biopic Has the Right Stuff – Venice". IndieWire. Penske Business Media. Archived from the original on August 30, 2018. Retrieved August 30, 2018. ↑ "Ryan Gosling's First Man is a space hero with soul". Archived from the original on October 15, 2018. Retrieved October 15, 2018. (Subscription required (help)). ↑ Barber, Nicholas (August 29, 2018). "Film review: Five stars for First Man". BBC Culture. BBC. Archived from the original on September 2, 2018. Retrieved September 3, 2018. ↑ Scott, A. O. (October 10, 2018). "Review: Review: 'First Man' Takes a Giant Leap for Man, a Smaller Step for Movies". The New York Times. A.G. Sulzberger. Archived from the original on October 13, 2018. Retrieved October 13, 2018. ↑ Lane, Anthony (October 8, 2018). "Damien Chazelle's Moon Shot in "First Man"". The New Yorker. Condé Nast. Archived from the original on October 14, 2018. Retrieved October 13, 2018. ↑ Brody, Rochard (October 10, 2018). ""First Man," Reviewed: Damien Chazelle's Neil Armstrong Bio-Pic Is an Accidental Right-Wing Fetish Object". The New Yorker. Condé Nast. Archived from the original on October 10, 2018. Retrieved November 11, 2018. ↑ White, Armond (October 12, 2018). "American Exceptionalism – Not! First Man Falters". National Review. Archived from the original on November 2, 2018. Retrieved October 31, 2018. ↑ Nordyke, Kimberly (December 10, 2018). "Critics' Choice Awards: 'The Favourite' Leads With 14 Nominations". The Hollywood Reporter. Retrieved February 17, 2018. ↑ Crist, Allison (January 13, 2019). "Critics' Choice Awards: 'Roma,' 'Americans,' 'Mrs. Maisel' Top Winners". The Hollywood Reporter. Retrieved February 17, 2019. ↑ Pond, Steve (February 10, 2019). "BAFTA Awards 2019: 'The Favourite' Dominates, But 'Roma' Wins the Big One". The Wrap. Retrieved February 17, 2019. ↑ Staff (December 6, 2018). "'Vice,' 'The Assassination of Gianni Versace' lead 2019 Golden Globe nominations". Los Angeles Times. Archived from the original on December 6, 2018. Retrieved February 17, 2018. ↑ "All the Winners of the 76th Golden Globes". Hollywood Foreign Press Association. January 6, 2019. Archived from the original on January 8, 2019. Retrieved February 17, 2019. ↑ "91st Oscars® Nomination Announced" (Press release). Los Angeles, CA: Academy of Motion Picture Arts and Sciences. January 22, 2019. Archived from the original on January 23, 2019. Retrieved February 17, 2019. ↑ Hipes, Patrick (August 31, 2018). "'First Man' Director Damien Chazelle & Neil Armstrong's Family On Flag Flap: It's Not A Political Statement". Deadline Hollywood. Archived from the original on September 2, 2018. Retrieved September 3, 2018. ↑ Rose, Steve (September 6, 2018). "'If anyone can Maga, it is Nasa': how First Man's flag 'snub' made space political again". The Guardian. Steve Rose. Archived from the original on September 6, 2018. Retrieved September 6, 2018. ↑ McAlone, Nathan (October 23, 2018). "The American flag controversy around 'First Man' isn't the reason it's struggling at the box office". Insider. Retrieved November 4, 2018. ↑ "Five things you didn't know about Janet Armstrong". Woman's Day. Australia. October 8, 2018. Archived from the original on October 31, 2018. Retrieved October 31, 2018 – via Pressreader.com. ↑ McNally, Siobhan (October 12, 2018). "True story behind First Man: Neil Armstrong's wife Janet was often a 'single mother' to their children while he pursued his dream". Daily Mirror. UK. Archived from the original on October 31, 2018. Retrieved October 31, 2018. ↑ Friedman, Chloé (October 16, 2018). "Janet Elizabeth Shearon, l'inébranlable épouse de Neil Armstrong". Le Figaro (in French). Archived from the original on October 31, 2018. Retrieved October 31, 2018. ↑ "Janet Shearon Armstrong 1934 - 2018". Houston Chronicle. June 27, 2018. Archived from the original on October 31, 2018. Retrieved October 31, 2018 – via Legacy.com.